30 Quotes About the Thirties Book! Recently, I’ve gotten in the habit of tracking every single dollar I spend. Jane, in her last money post, Saving Money Like You’re In the Depression Era, just wrote about tracking all of her money, bit by bit. As we’ve always suspected, Jane and I must have a psychic connection because I had just started doing the same thing with my money. The reason it’s amazing that we both started tracking money at the same time is because we have been adamant about NOT tracking money in the past. It made both of us extremely nervous to track money- we always felt like we were frugal enough and that tracking every dollar stopped us from enjoying the tiny indulgences in life. I began tracking money because I realized that my dollars were disappearing faster than I’d like. I’m an extremely frugal person, so money mysteriously disappearing irritated me greatly. Since I don’t make a budget from month to month, I rely on my frugality alone to keep me in check. Since that didn’t seem to be working anymore, I went over my credit card statements and was amazed to see that so many little tiny $4.00 or $6.00 purchases had added up. In some cases tiny purchases had added up to hundreds of dollars! I had attempted to track my spending a few times in the past (giving up after maybe 2 days) and those times I’d used pen and paper to write down whenever I bought something. That wasn’t the best option for me because I’d lose the paper I wrote the expenditures on, so this time I downloaded two money tracking apps- things are easier to keep control of electronically. After playing with both apps, I really started using and enjoying this one called Goodbudget. It’s free in the App Store (and probably the Android Google Play store too). The app is great because it’s simple and it allows me to make categories of spending so I can see where I’m spending the bulk of my money. Whenever I buy something that doesn’t fit into my previous categories, I simply add a new category. With my trusty new money tracking app, Goodbudget, I’ve succeeded in tracking every dollar of my money for a few weeks now. That’s a record for me! And what’s really interesting is that I spend less money because I’m more aware of my money being spent..and it kind of bothers me to see the amount of money I’m spending go up uncomfortably high right in front of my face. So I question some tiny purchases (a latte here or there, a new shirt, however affordable), that I would’ve otherwise barely thought twice about if I hadn’t been keeping my monthly expenditure right in front of me. Now I know how quickly small costs can add up. I always hated weighing myself too, because the scale made me nervous and anxious in the past, but I’ve found that it really does help me to have a number in front of my face to keep me accountable. 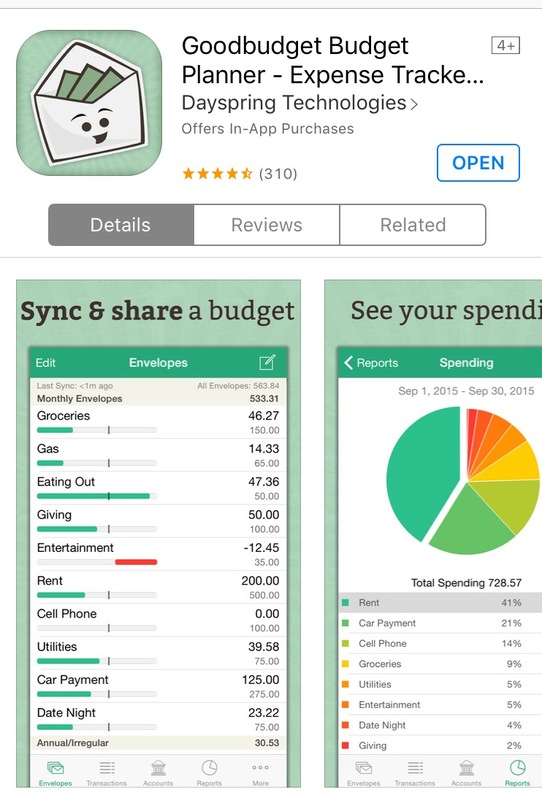 If you haven’t tried budgeting apps- even if just to write down all your purchases the way I have- I recommend giving one of them (such as Goodbudget) a try. Even if you’re frugal, you may be spending more money than you realize. And when you stop spending money mindlessly on things, you’ll have more of it to spend on the tiny luxuries you actually love. Start here: Enter your email address to receive new posts quickly and easily by email! Click Here to Follow Via Email! Are You Habitually Upset In Your Thirties? Origin of the Expression "Dirty Thirty"
30 Quotes About the 30's! Are We The "Slash" Generation? Have We Become the Slash Generation to Compensate for an Economy that's Failing Us?